Far below the earth’s surface, water drips from the roof of a cave. The drops fall through the darkness into a large stone room no one has ever seen. No bird has ever sung here. The scent of wildflowers has never hung in the air. For thousands of years, the tomblike silence has been broken only by the sound of falling water. Drip. Drip. Drip. 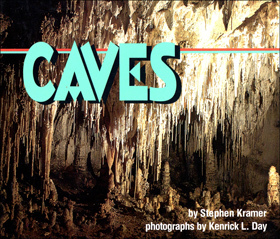 Join Stephen Kramer and photographer Kenrick Day as they describe in words and pictures how caves form and what amazing animals, plants, and rock creations can be found inside them. See how cavers walk, climb, crawl, and squirm through places they’ve never been before. And learn how to “cave softly,” protecting these delicate environments as you explore the dark, silent world underground.